Can you believe that it’s spring already? The peach and almond trees outside my window are well into budburst, confirming that it must be true. It feels like yesterday that I was firing off the first forecast of the season. They say time flies when you’re having a hoot, and this season hasn’t been an exception. It has indeed been one of the best seasons in the past couple of decades. Rather than just compare peak snow depths, the best way to asses a season is to look at “snow depth days”. This is the area under a snow depth chart, otherwise known as the integral, which is just the sum of snow depth readings from each day. The area under the Spencer’s Creek snow depth chart from this season explains why we’ve been having such a hoot. By just eyeballing charts of the previous couple of decades, we can place this season up on the podium with other notable years, such as 2000 and 2004, which also had massive snow depth days. Last year was an exceptional season, but even that is currently being nudged out of medal contention by this season’s whopping snow depth days. Awesome August has definitely been one for the books, as outlined in Reggae Elliss’ blow by blow account of what happened that month. 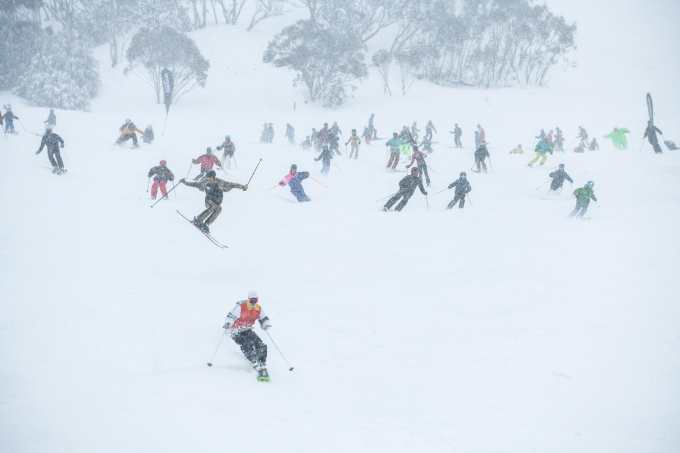 This comes despite below average precipitation in the Aussie Alps for the month, although the Mount Buller region looked to have more than usual. August was also chilly in the mountains with below average maximum, minimum and 1500m temperatures. The absence of warm rain events, which tend to have a higher moisture content, saw that a ton of snow fell during cold outbreaks, but ultimately left cold dry conditions. As I’ve mentioned in previous outlooks, a cold wet season is ideal for high snow depth days, but there are plenty of seasons that buck this trend with either warm or dry conditions. It’s also no surprise that the Southern Annular Mode (SAM) was negative for most of Awesome August, meaning all that cold Antarctic air and juicy storm systems had migrated further north to unload their snowy goodness onto our slopes. Yes, that right, you heard correctly. It’s hard to believe after such consistent snowfalls, but global models show the next ten days or so will be dominated by high pressure, interspersed by warm northerlies and rain this Thursday and possibly next Tuesday and Wednesday. 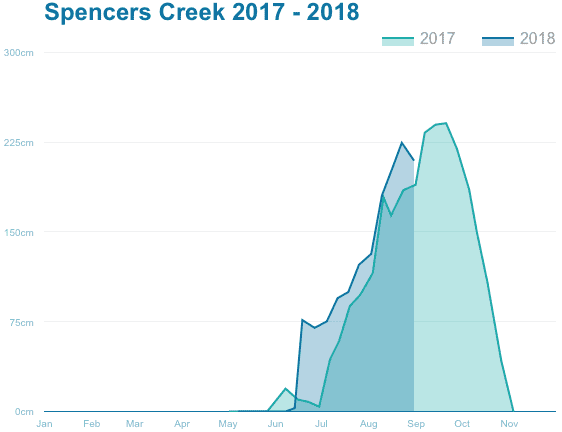 As a result, the snowpack will take a hammering and we may not see the snow depth at Spencer’s Creek bounce back to the recent 224.6cm measured on the 22ndof August. NOAA’s weather model, the “GFS”, attempts to simulate the atmosphere all the way out to sixteen days. After ten days out, you really have to tread with caution. Often though, models this far out can give a fair indication of whether we can expect settled or unsettled weather around a certain time. The nitty gritty details are likely to be incorrect, but the basic idea may not be too far from reality. In this instance, the GFS is signalling that we’re unlikely to get any meaningful snowfalls all the way out to the 19thof September. I know, stink aye. There is however, a patch of unsettled weather around the middle of the month where the 540 line crosses the Aussie Alps; it looks fleeting, but it’s worth crossing our ski’s for. Furthermore, SAM has gone astray and found himself on the positive side, meaning all that cold air is now tucked up closer to Antarctica. SAM should approach neutral or even negative values around mid-September, offering us a glimmer of hope that we may have one last hoorah before we hang up our skis. In light of the epic season so far, some resorts have extended their season to the 7thof October. It’s also worth looking further ahead until the end of October, because this is prime-time for back-country skiing. Looking this far ahead requires a little more head scratching while trying to fumble our way through the labyrinth of climate drivers and climate models. Although October usually sees the snowpack steadily decline to bare tussock by the end of the month, the speed at which this happens can vary. A good year may see snow depths at Spencer’s Creek hit the zero mark after the first week of November, while a bad year may see that happen a couple of weeks earlier. In 2006 we hit the zero mark on the 5thof October, yeeesh. That’s not going to happen this year, but the overall vibe from climate drivers and models isn’t all that good, folks. Waters across the tropical Pacific are now near-to-above average and it is likely El Niño thresholds will be met sometime this spring – I’m betting during October. El Niños are bad news for Aussie Snow, so we might start feeling the pinch of its influence; September is certainly shaping up to look rather El Niño-ish. To rub more salt in the wound, there’s a chance we might see a positive phase of the Indian Ocean Dipole (IOD) this September or October. Positive IODs act to supress snowfall in the Aussie Alps by starving frontal bands of moisture. Whether or not El Niño or a positive IOD do occur, we can’t expect any help from the Pacific and Indian oceans. The C3S model showing there is a greater chance of being dry this spring, but that temps could go either way. Other climate models hint that we’re likely to be warmer than average. The general consensus from a number of climate models show that spring as a whole may end up being slightly dry for the Aussie Alps, while temperatures are likely to be average or above. We’re also likely to have average to high pressure anomalies, indicating we may have more settled weather, which matches up with shorter-term global models. Although this doesn’t give us details about each individual month, we can conclude that things don’t look particularly favourable for an epic spring. The BOM does break it down into more detail for us. They indicate there is an equal chance that September will be warm or cold, and that October is likely to be warm. They also suggest that the rest of the season will remain on the dry side. This gives us the sense that we’re sliding down the awesome spectrum towards the nasty end, which fits the idea that El Niño will start exerting it’s will upon us and is consistent with my previous outlook. The BOM reckons that September will look alright, but October will be balmier than normal. As a result, we could expect a lot of slushy snow and plenty of t-shirt days. After pouring over every scrap of climate info I can get my six legs onto, I’m convinced that we’ve already reached peak snow depth for the season, and that we’re on a slippery slope to the end. Our best bet for more snow will be mid to late September, but it would have to be something extraordinary to undo the melting that will occur by that time. Remember however, we still have a healthy snowpack that should see us through to the end. So, there’s plenty of slide time left and I actually love slushy spring time skiing; it doesn’t hurt when you fall, plus you get to rock around in a t-shirt and no beanie on sunny days. Even if we don’t see another snowflake this year, and we predict a steady decline of the snowpack to bare tussock sometime around the end of October, this season will still be proudly up there on the podium of high snow depth days – the real measure of a truly epic season. Hopefully, I have shed some light on what to expect this spring, or at least provided you some fodder to mull over. This is my last outlook for the season, but keep your eyes glued to my daily forecasts to see how things are panning out. If you’ve got a different theory on what’s going to happen this spring, or just want to provide feedback, then please hit me up using the comments section below. Or you can follow me on Facebook. This article was helped brought to you by Mount Hotham. What a year to be a season pass holder! 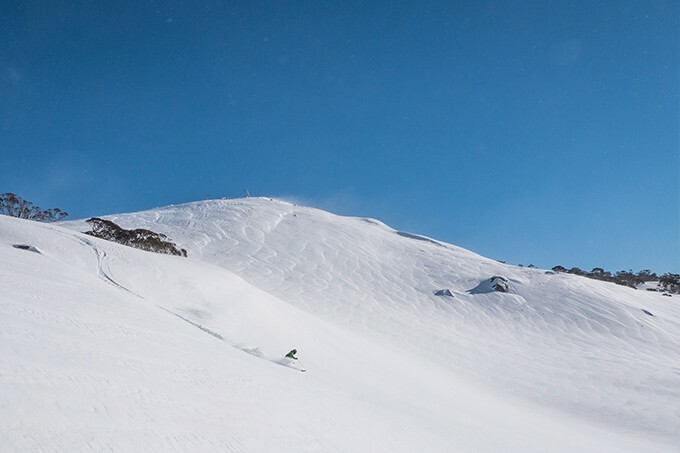 With a record-breaking season, now is the time to look into the Hotham and Falls Creek season pass for 2019. The only pass with access to two Australian resorts is now on sale and there is a lot of value to be had. It can be secured for a deposit of just $99 for an adult pass. At Hotham, if you secure the season pass before 17 September you even have the chance to win Qantas Flight Vouchers, each valued at $500. Find out more here!